Also known as the “Gateway State”, the East North Central state of Ohio is an excellent golf destination that guarantees player satisfaction with its vast selection of over 800 golf courses and clubs scattered all over the area. Though the state is mainly comprised of plains and flatlands, it also features beaches, sand dunes, towering cliffs, rolling hills and sloping valleys from all around. Such a widely varied geography makes Ohio a prime location for some truly spectacular and challenging golf courses this side of the Atlantic. Many distinguished architects seemed to have thought so too, as they’ve left their indelible mark on the state by creating some of the most exceptional championship courses that have garnered national and historical acclaim. Examples that come to mind include Michael Hurdzan and Dana Fry's Little Mountain Country Club and Stonewater Club, Pete Dye's Fowler's Mill, and Donald Ross' Denison Golf Club at Granville. However, the widely varied climate in Ohio often ranges from one extreme to another, with summers reaching up to a scorching 90°F and winters a freezing 0 °F. Golfers should also be wary of tornadoes, thunderstorms, and rainfall that often occur during late spring and early summer. This leaves a very small window for golf season sometime during the brief months of September and October. With that said, avid golfers need not worry about such troubling weather, as they can easily get their golfing fix from any of the excellent indoor golf establishments spread throughout the state. Ohio offers many first-rate facilities and virtual golf centers that allow patrons to play on a number of highly acclaimed 18-hole championship courses from all around the world. Enumerated below are some of the best virtual and indoor golf courses in Ohio, including some training centers and indoor miniature golf courses. The Links Indoor Golf Club is a premier indoor golf facility that is located one mile away from downtown Findlay, Ohio. The Links Indoor Golf offers a different kind of experience compared to the other facilities in Ohio because they make it a point to have the best and latest simulators and equipment. When players play a round of virtual golf at The Links, their widescreen simulators will transport them as if they playing on the actual course itself. The Links Indoor Golf is accommodating to players of all skill sets. Whether you are a novice or a seasoned veteran, everyone is guaranteed to have a great time at The Links Indoor Golf. There are over 60 different courses, including 16 premier courses, from all over the globe to choose from such as TPC Sawgrass, St. Andrews, Harbour Town, and Pebble Beach. You can also use their practice facilities to warm up before taking on an 18-hole course in the actual game. Aside from golf, you can also play some ski-ball. There are lounge chairs and tables found at the bar to unwind and relax after a game. The bar offers a variety of beers and drinks that will help you loosen up a bit. High-quality TVs are also available inside. This facility can also be the perfect venue to bond with friends and family or to host special events like anniversaries or birthday parties. Located in Worthington, Tee’d Up Indoor Golf is one of the best indoor golf facilities in Ohio. With over 22 different PGA courses to choose from, Tee’d Up Indoor Golf creates highly realistic and accurate sceneries and golfing scenarios that will seemingly transport you to the actual courses themselves. The sensors that are used in this facility measure the speed, loft, and distance of every shot. Minus the hassle of traveling to the actual locations, you can have access to 22 premium championship courses from all over the globe such as Pebble Beach, Bay Hill, Prairie Dunes Country Club, Mauna Kea, and Castle Pine Golf Club. You can also relax in their bar or comfortable chairs and have a beer or two. Tee’d Up Indoor Golf has a wide selection of beer and drinks to choose from. Schedule or Call for a tee time ahead. 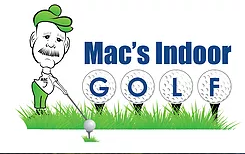 Mac’s Indoor Golf has been in the business for over 8 years. Located in Summit County, Ohio, Mac’s Indoor Golf features 50 different 18-hole world-class championship courses. Using the latest indoor golf technology, Mac’s Indoor Golf has full swing golf simulators with high-quality and crisp displays. You may bring your own clubs or use the facility-provided clubs for playing. They also have a driving range so you can practice before an actual game or just practice to improve your skills even further. The most important differentiation that separates indoor golf from actual golf is that you can always play it all year-round regardless if it’s freezing, pouring, or scorching hot outside. It also allows you the luxury of accessing elite courses located in different states or countries within seconds. At Mac’s Indoor Golf, you don’t need to worry about bringing your own food. You’ll never go hungry or thirsty inside this facility as they have a delectable selection of snacks and food on the menu such as hotdogs and pretzels. They also serve different beverages at the bar such as beer, red and white wine, sodas, and coffee. 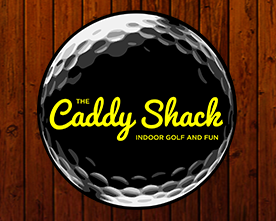 The Caddy Shack Indoor Golf and Fun is a well-known indoor golf facility that features five first-rate PGA simulators that allow players to experience different championship courses from all over the globe within minutes. These high-tech simulators display accurate, realistic, and sharp images aside from measuring the distance and speed of every shot. An impressive list of PGA approved courses are included in The Caddy Shack collection such as Pebble Beach, The Links at Spanish Bay, TPC Sawgrass, TPC Scottsdale, TPC Louisiana, and The Old Course at St. Andrews Links. Both pro and amateur golfers are welcome here. The Caddy Shack also offers lessons for golfers who need help on enhancing their skills with the aim of improving their performance for the real course. They also have practice facilities where you can warm up before a game or just fine-tune your skills in preparation for an actual game at a real course. The Caddy Shack also offers a wide variety of food and beverages at the facility. They have 25 different craft beers to choose from and delectable food such as pizza and grilled cheese sandwiches sold at affordable prices. Aside from the golf simulators, The Caddy Shack also offers other indoor recreation activities. An Eleetus Racing simulator, giant Jenga, pool tables, and a karaoke can also be found inside the facility. Found in Lorain County, Ohio, Golf Zone is a popular indoor golf facility that offers an amazing indoor golf experience at an affordable price. With a wide selection of courses to choose from, Golf Zone offers these elite courses at your fingertips without having to worry about good golfing weather to accompany you during your round. Among the select championship courses featured at Golf Zone are The Old Course at St. Andrews, Harbour Town, Bear Creek, and Pebble Beach. The facility is closed on Mondays during summer. Located in Toledo, home of various tourist attractions in Ohio, Pro Golf Fairways Academy & Tech LLC is another indoor golf destination that enthusiasts must visit when you live in the area or just visiting. Pro Golf Fairways Academy is a complete indoor facility that offers a premier golfing experience with their high-quality simulators that create crisp and detailed images, driving ranges, and other facilities that are designed for you to enjoy the game as much as possible. With over 100 different public and private courses to choose from, Pro Golf Fairways Academy & Tech LLC guarantees you a different experience every time you visit. Their fully stocked golf store is also composed of premier branded golfing essentials. Pro Golf Fairways Academy also offers indoor and outdoor golf lessons to help amateur golfers enhance their skills. Lessons can range from an hour to a duration of up to 6 months depending on your skill level and desired results. Found inside a real golf course, Valleaire Golf Club offers both indoor and outdoor golf courses for you to choose from. Located in Northeast Ohio, the indoor golf course is especially useful when the weather outside is not that golf-friendly; northeast Ohio is especially known for having lengthy and harsh winters. Valleaire Golf Club only uses the best golf simulators in the business. Featuring High Definition Golf Simulators, the golfing experience found in this indoor facility is truly something else. The images displayed are very accurate and detailed. The simulator also provides relevant info such as the ball speed, club angle, and distance. A maximum of 8 players can play in one golf simulator so you can schedule a game with your friends and family for those memorable bonding moments. Alien Vacation Mini Golf Attraction is an 18-hole indoor mini golf facility found inside Castle Noel. The course is filled with an otherworldly amount of neon lights and colors that makes it even more attractive and fun to play in. There are different obstacles found in the course which are filled with different designs. This fun-filled indoor facility not only provides an intricate layout for golfers to accomplish but also with amusing designs and activities to make your visit fun and memorable. There are Sci-Fi movie props found all over the place which you can take photos of every now and again while playing. This mini-golf course is open to players of all ages, some even as young as 3 years old. Different Artworks are also prominently displayed all throughout the course. They are open to hosting different events and special occasions such as birthday parties, corporate events, weddings, team buildings, and anniversaries. The facility is closed during Thanksgiving Day, Christmas Eve, Christmas Day, New Year’s Eve, New Year’s Day, Easter, Memorial Day, and 4th of July. Giving golfers the chance to enjoy the ultimate in virtual golfing experience, The Golf Dome offers a bevy of golfing activities to choose from. Featuring the latest technology, their golf simulators offer some of the world’s most famous championship courses that can be played within minutes of each other if you wish to. The facility is open during summer and winter so no matter what the weather is outside, you can always count on enjoying a round or two inside a sheltered environment and transport yourselves to your course of choice. Aside from the golf simulators, The Golf Dome also offers 34 different tee stations at their driving range where you can practice before an actual game or just hone your skills further. The driving range is located inside a large dome with a heater so you can always play comfortably even during the cold months. They also offer golf lessons, clinics, and camps so beginners and mid-level players can seek professional help on how to improve their skills. The Golf Dome is also open to hosting special events like birthday parties and other special occasions. You can check out their website for more info on these affordable packages. Golftec has been known for its quality services and has multiple branches all over the globe. Ohio is just one of the states where it has multiple branches. They are present in 11 different locations throughout the state, namely: Cleveland West, Dublin, Canton, Fairlawn, Brecksville, Cleveland East, Dayton, Blue Ash, Stonebrook, Easton, and Toledo. All of these branches have professional coaches that can help amateur golfers correct any flaws and improve their skills in terms of accuracy, swing, and club angle. Featuring the most advanced technology, this premier indoor facility gives golfers the chance to enjoy state-of-the-art equipment and world-class simulators at an affordable price from any of their branches. They feature some of the most famous courses in the world including Pebble Beach and The Old Course at St. Andrews. Golftec also offers other services and amenities aside from their virtual golf facility and lessons. They also provide Custom Club Fitting services available at any of their branch. A hidden gem of a golf destination, many avid golfers often travel to Ohio to experience all the fine courses it has to offer, with gorgeous natural sceneries and formidable, well-designed layouts set in the idyllic countryside. However, when the weather is simply not permitting (as it can often be, considering the highly variable climate Ohio is known for), an excellent game of virtual golf indoors can quell any golf enthusiast’s thirst for the game. Ohio offers plenty of top-quality choices in terms of indoor golf centers, often equipped with high-tech facilities and state-of-the-art golf simulators programmed with the latest technology to deliver the most realistic gaming experience. Players can now maintain their golf skills even during the off-season, while recreational golfers can enjoy a few rounds on some of the world’s best courses all-year round at affordable rates from just one location. 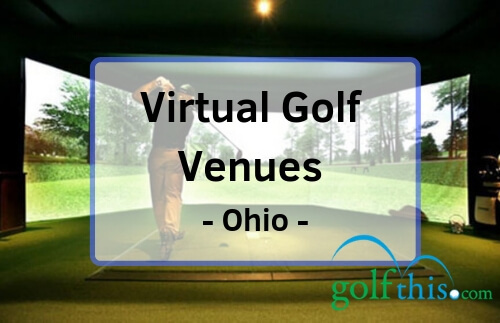 With that in mind, the names featured above are merely a starting point for discussion and your own personal search, as this is by no means a definitive list of all the virtual and indoor golf facilities in Ohio. If you happen to stumble across a particularly noteworthy indoor or virtual golf facility, kindly let us know. We’d be more than happy to hear from you.